Ryan JJ, Dows BL, Kirk MV, Chen X, Eastman JR, Dyer RJ, Kier LB. 2010. A systems biology approach to invasive behavior: comparing cancer metastasis and suburban sprawl development. BMC Research Notes, 3 36. Background: Despite constant progress, cancer remains the second leading cause of death in the United States. The ability of tumors to metastasize is central to this dilemma, as many studies demonstrate successful treatment correlating to diagnosis prior to cancer spread. Hence a better understanding of cancer invasiveness and metastasis could provide critical insight. Presentation of the hypothesis: We hypothesize that a systems biology-based comparison of cancer invasiveness and suburban sprawl will reveal similarities that are instructive. Testing the hypothesis: We compare the structure and behavior of invasive cancer to suburban sprawl development. While these two systems differ vastly in dimension, they appear to adhere to scale-invariant laws consistent with invasive behavior in general. We demonstrate that cancer and sprawl have striking similarities in their natural history, initiating factors, patterns of invasion, vessel distribution and even methods of causing death. 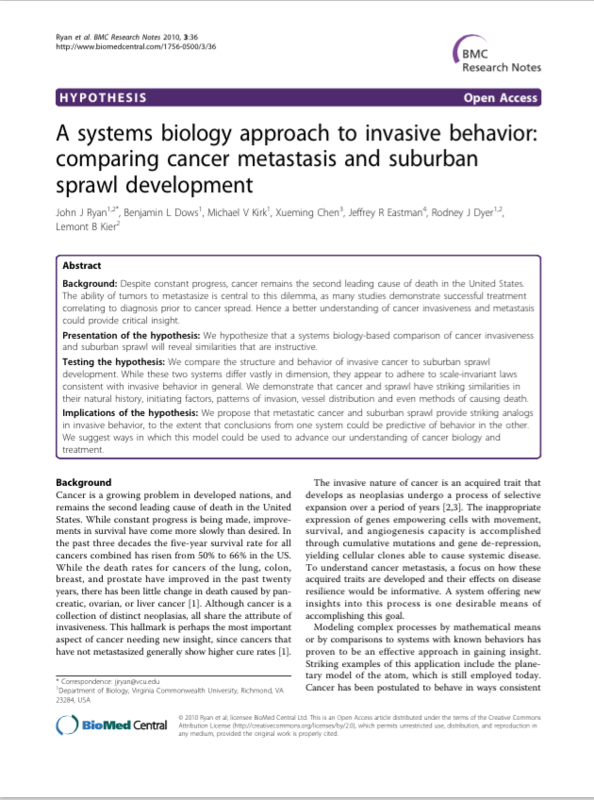 Implications of the hypothesis: We propose that metastatic cancer and suburban sprawl provide striking analogs in invasive behavior, to the extent that conclusions from one system could be predictive of behavior in the other. We suggest ways in which this model could be used to advance our understanding of cancer biology and treatment.